As Sidebar readers know, Stephen Langendorfer PhD, editor of a peer-reviewed aquatics journal called IJARE and a department head at Ohio's Bowling Green State University, is playing ostrich re: a retraction request filed last year by Ed Castillo who runs Golden State Lifeguards out of Woodland Hills, CA. As I reported a few weeks ago, Langendorfer "purposefully" refused to respond to Castillo's request that a discredited drowning rescue study published in IJARE be given the heave-ho. The study, which concluded that abdominal thrusts (the Heimich maneuver) are an effective treatment for drowning, was authored by two non-medical professionals, John Hunsucker PhD and Scott Davison of the National Aquatic Safety Company (NASCO), a Houston-area lifeguard training company which has been the subject of wide-ranging criticism for promoting the thoroughly-discredited treatment. In January, after decades of what Aquatics International magazine called "using people as guinea pigs," NASCO finally gave up the ghost. Since Langendorfer's in hiding, Castillo just took his retraction request upstream to the head of Human Kinetics, the $37 million/year company responsible for publishing the squiffy study. Therefore this e-mail is to formally submit my request to you. Southern California’s Premier provider of private lifeguards since 2006! 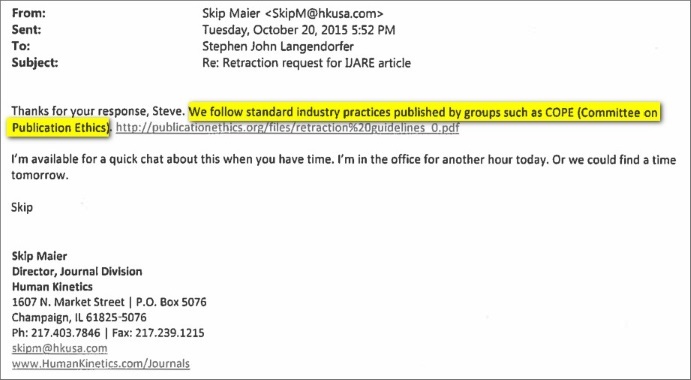 Per the e-mail below, Maier claims that his company follows the retraction guidelines of the Committee on Public Ethics (COPE). Click here for a copy those guidelines. Courtesy of Castillo's e-mail, presumably we'll learn if he's true to his word or if he'll try to pull a Langendorfer. Click here for a copy of the NASCO study, a scorching analysis/rebuttal by leading medical and water safety experts, and more.